Burlington, Wisconsin resident Dan Jinar volunteers by helping sort donated clothes at Pablo's Restaurant and Cantina in Crystal Lake Dec. 25. 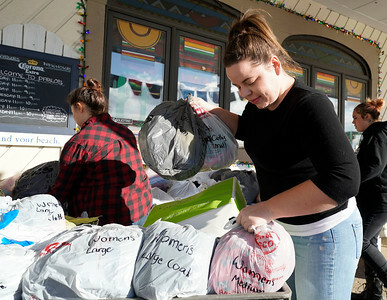 Crystal Lake resident Marina Mularz volunteers by helping sort donated clothes at Pablo's Restaurant and Cantina in Crystal Lake Dec. 25. 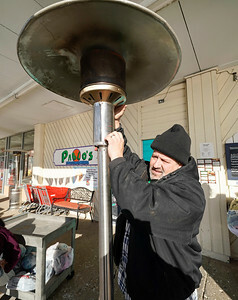 Employee Fred Falbo works on setting up a heater at Pablo's Restaurant and Cantina in Crystal Lake Dec. 25. 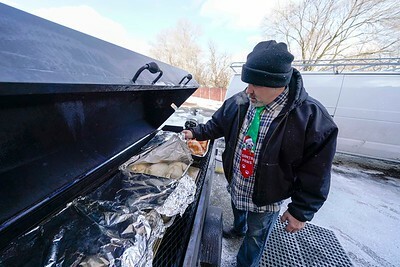 Employee Fred Falbo prepares food at Pablo's Restaurant and Cantina in Crystal Lake Dec. 25. 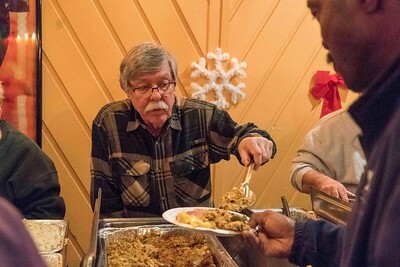 Schererville, Indiana resident Keith Johnson volunteers his time by preparing food at Pablo's Restaurant and Cantina in Crystal Lake Dec. 25. 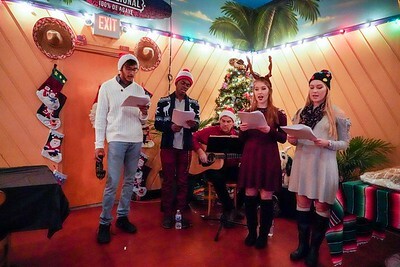 (left to right) Urvaksh Avanthsa, Corey Barlow, Paul Bell, Kendra Bell and Niks Bell sing holiday songs at Pablo's Restaurant and Cantina in Crystal Lake Dec. 25. 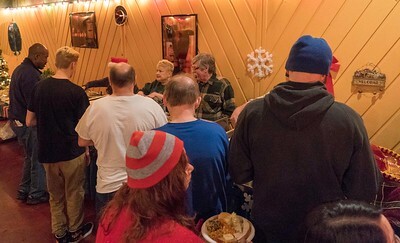 Owner Jennifer Flabo gives last minute instructions to volunteers and employees at Pablo's Restaurant and Cantina in Crystal Lake Dec. 25. 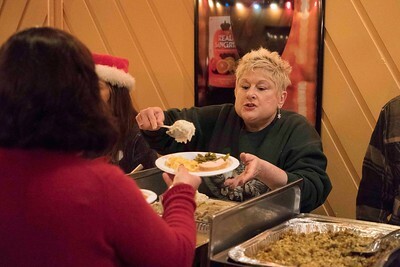 Volunteer Paula Temple of Prairie Grove, helps serve food at Pablo's Restaurant and Cantina in Crystal Lake Dec. 25. 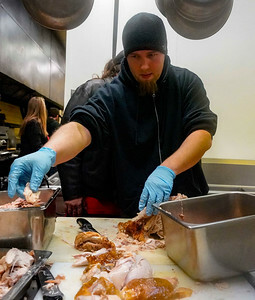 Volunteer Mike Reboletti of Crystal Lake, helps serve food at Pablo's Restaurant and Cantina in Crystal Lake Dec. 25. 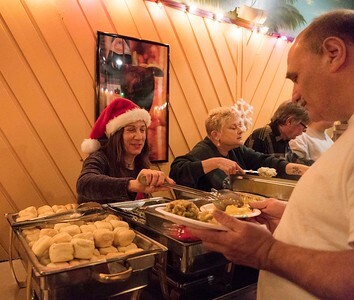 Volunteer Marty Temple of Prairie Grove, helps serve food at Pablo's Restaurant and Cantina in Crystal Lake Dec. 25. Volunteers help serve the needy at Pablo's Restaurant and Cantina in Crystal Lake Dec. 25. 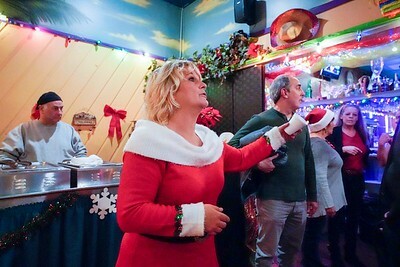 Volunteer Karen Dannelson of Crystal Lake, helps serve food at Pablo's Restaurant and Cantina in Crystal Lake Dec. 25. 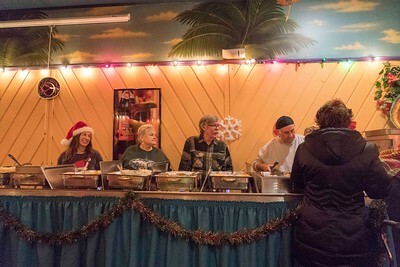 (Left to right) Volunteers Karen Dannelson, Paula and Marty Temple and Moike Reboletti help serve food to needy at Pablo's Restaurant and Cantina in Crystal Lake Dec. 25. 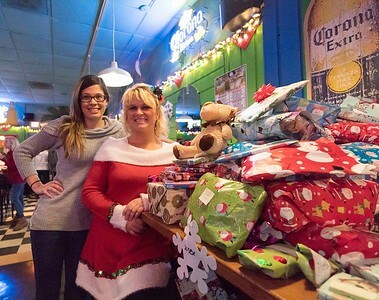 Employee Danielle Leschuk and Owner Jennifer Flabo stand next to a pile of donated gifts to help the needy at Pablo's Restaurant and Cantina in Crystal Lake Dec. 25. 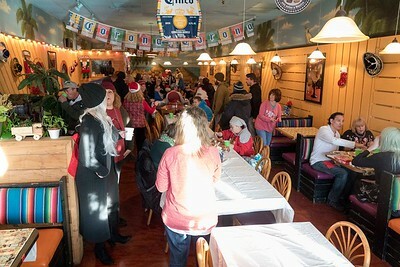 Volunteers and Employees help feed to feed the needy at Pablo's Restaurant and Cantina in Crystal Lake Dec. 25. 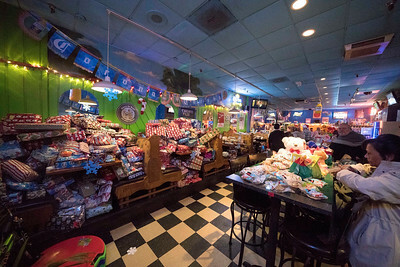 A large number of gifts were donated to help the needy at Pablo's Restaurant and Cantina in Crystal Lake Dec. 25.